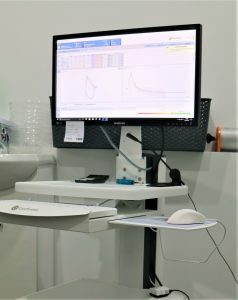 Norwood Specialist Clinic has been equipped with a brand-new respiratory function testing lab on prominent Magill Road with parking available onsite for patients. We have testing available Monday, Tuesday, Wednesday and Friday and can get patients seen within a week, we can often get patients seen on the same day! Reports are analysed by a respiratory physician and are faxed to the referring Doctor on the same day as testing. Measures the amount (volume) of air breathed in and out of the lungs. It is usually performed before and after bronchodilator to assess reversibility of airflow obstruction. Spirometry testing provides information about the size of the lungs and can identify the degree of airway narrowing. Respiratory function tests are a group of tests that measure a person’s breathing and how well their lungs are functioning. Spirometry (Pre & Post Bronchodilator) as mentioned above. This test measures how well the lungs exchange gases and can be used to identify conditions affecting the lung parenchyma and pulmonary vascular bed. 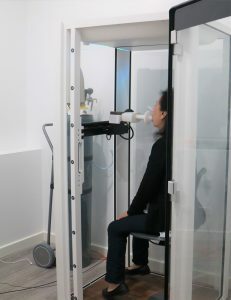 Measures the total amount of air in your lungs (total lung capacity) and the volume of air left after breathing out completely (residual volume). This test is used to identify hyperinflation of the lungs and gas trapping. It is also useful for detecting restrictive and mixed ventilatory defects. The mannitol challenge test (Aridol®) is a bronchial challenge test that can be used to identify bronchial hyperresponsivesness, a key clinical feature of respiratory conditions such as asthma. During a mannitol challenge test, the subject inhales increasing doses of mannitol with their forced expiratory volume in one second measured following each dose to determine the level of bronchial hyperresponsiveness. This test is used to measure exercise tolerance in chronic respiratory disease whilst monitoring oxygen saturation. It measures the distance you are able to walk in six minutes.